Focus Funds – Diversification may preserve wealth, but concentration builds wealth – it is a famous saying by Investment Guru Warren Buffett. It clearly means that if you want to preserve wealth go for diversification and if you want to build wealth go for focus investment. Keeping above thought in mind today’s our topic is on focus investment by using focused funds. A focused fund invests in a limited number of stocks. Focused funds have the potential to generate higher returns compared to a diversified fund. In a diversified equity fund investment is done in a large number of stocks. The diversification of fund helps the investor in minimizing risk and volatility. However, diversification can limit the returns. To maximize return many people prefer investing in a focused fund. What is a focused fund? Which are best performing focused fund in India? Who should invest in Focused Fund? Let’s try to explore and get answers to these questions. A Focused Fund invests in a limited number of stocks with limited sectors. It builds a concentrated stock portfolio. The objective of the focused fund is to deliver high returns by investing in a limited number of quality stock with higher potential. In India, as per SEBI guideline, a focused fund can invest in maximum 30 stocks. This is against diversified fund which invests money in 50 or even more stocks. Some focused mutual funds clearly specify in objective about their focus on mid-cap or large-cap stocks. Other do not specify anything. The first thing you need to see is an experience of fund manager and expertise towards a selection of stocks. It plays a crucial role in the generation of wealth. The second factor is checking objective about a focus on the mid-cap or large-cap funds. It should match with your investment objective. Look at the top holding of the fund. This will help in knowing the concentration of fund manager. Check about which filters are applied by the fund manager for the selection of stock. Consider checking the performance history of focused fund where you are planning to invest your money. 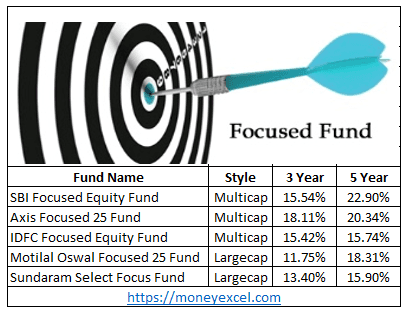 Top 5 Best Performing Focused Fund in India are given below. SBI Focused Equity Fund – SBI Focused Equity Fund invests in high growth-oriented companies. This fund also invests in some lesser-known companies. This fund follows multi-cap investment strategy. SBI Focused Equity Fund has generated 22.90% annualized returns for the investor in last 5 years. Axis Focused 25 Fund – Axis Focused 25 fund aims to generate long-term capital appreciation by investing in a concentrated portfolio of equity & equity related instruments of up to 25 companies. This fund has generated 20.34% annualized returns in the last 5 years. IDFC Focused Equity Fund – IDFC Focused Equity Fund invests in 30 growth-oriented stocks. The objective of this fund is to generate capital appreciation and provide income distribution. In the last 5 years, this fund has generated 15.74% returns in the last 5 years. Motilal Oswal Focused 25 Fund – Motilal Oswal Focused 25 Fund has built a concentrated portfolio of 25 stocks in large-cap segment. The fund gave 18.31% return in the last 5 years. Sundaram Select Focus Fund – Sundaram Select Focus Fund aims to achieve capital appreciation through concentrated investments in equity and equity related instruments of large-cap companies. This fund has generated 15.9% return in last 5 years. Who should invest in Focused Fund? The focused funds are not everyone’s cup of tea. The investor with high-risk appetite and deep understanding about sectors, industries, and pattern can invest in focused funds. The high returns offered by these funds comes with high risk. This is the main reason that these funds are not recommended for everyone, especially for new investors. A new investor should stay away from these funds. If you are familiar with mutual fund investment and you have high-risk appetite with moderate investment horizon (3 to 5 years) you can think of investing in a focused fund. Make sure your investment objective meets with fund objective before investing.